Unisol 4 Replacements, Preservative Free Saline Alternatives for Kearatoconus Patients. Great Replacement Salines for Unisol 4 Users! The preservative free Unisol 4 was great saline solution for dry eyes and keratoconus patients. The preservatives that keeps most bottled solution from contamination are known irritants for people with dry eyes and keratoconus. Ever since Unisol 4 stopped production, we have been looking for replacement that performs as good as Unisol 4. Menicon America, one of major player in rigid gas permeable (RGP) contact lens manufacturer and maker of Unique Ph RGP solutions introduced Lacripure preservative free single dose packs. Unisol 4 was great non preserved saline solution to rinse and fill the contact lenses before insertion into eyes. 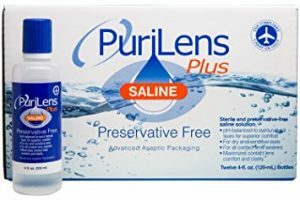 Purilens solution was first product to fill the void but it was hard to get more information on product and manufacturer. Lacripure saline solution was introduced by Menicon America soon after. Because we are big fan of Unique PH RGP solution and Progent protein deposit remover, we are biased toward to Lacripure Salines. How Lacripure and Purilens are Packaged? Purilens comes in 4 pack 4 oz bottles ( 16 oz) and Lacripure comes in 98 pack of 0.17oz unit-dose(16.6oz). Once it is opened, Purilens bottle expires in 15 days. Any multi dose bottles have contamination risk and need special care to keep the tips of bottles from touching any objects. 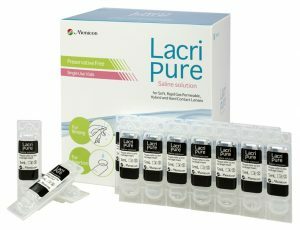 Lacripure is 0.17oz unit dose vile ( use once and discard) and has close to no contamination risk. Most of large diameter keratoconus lens and Prosthesis user are strongly recommend unit dose package to reduce risk of infection. Where Can You Buy Lacripure or Purilens? Menicon sells their product directly from their web site. Before you knocking on Menicon website you need a code < 004 682 C > to access their consumer site. Purilens are sold on their web site as well. 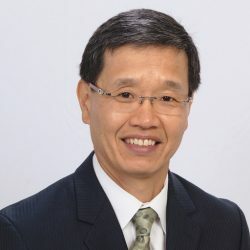 Previous PostPrevious Comfortable Keratoconus Contact Lenses -Is it Possible?